Malak (in the Coup de Coeur section of the festival) is the story of a teenage Moroccan girl who falls pregnant and her attempts to find a solution to her situation. That’s the plotline, but Malak is really a film about the marginalised in society; about the diversity of modern Moroccan society and the taboos that people face when they depart from socially acceptable behaviour. Malak is also a tale of how help sometimes comes from the quarters you least expect – and not always from the people you think you can rely on. And how, the easiest thing to do is to turn one’s back and ignore a problem; the harder job is to act with humility and understanding. What the characters in this film also show is that humility and understanding don’t cost any money: those who have the least are often the ones most willing to give. Director Abdeslam Kelai, whose disability due to childhood polio has been a great motivating factor in his own life and who hails from Larache (in Northern Morocco), where he based Malak, directs an empathetic and sensitive – but at times harrowing – film. But it one which is worth watching to get a real insight into Moroccan society today, not least into the complex position of women within it. Chaimae Ben Acha plays Malak with the depth one would expect of a far more experienced actress and convincingly portrays her loss of innocence. More information on Moroccan cinema is available here. 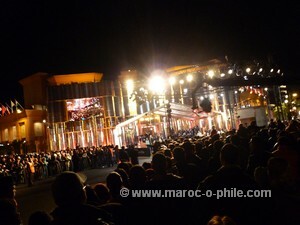 Other films reviews from the 12th Marrakech International Film Festival are available under the Moroccan Musings tab. This entry was posted in Moroccan Musings and tagged blog, culture, film, Marrakech, Morocco, reviews, travel on December 4, 2012 by lynn.